Winter hiking in Zion National Park is a beautiful experience, but just like winter hiking anywhere, it presents its own set of challenges. Whether you’re heading out on your own or on a guided hike, be sure to think ahead and plan for all conditions before you hit the trails. We’ve rounded up eight tips to help you stay safe during your Zion winter hike. Winter hiking is just like going outside for other winter activities. That means dressing in layers just like you would camping. Don’t forget extra socks, gloves, and a hat. Bring a dry change of clothes and spare shoes to keep in the car, too. You may find snow and ice accumulation as you head out of the canyon on trails, so traction aides are recommended. The sun sets early in winter, so don’t head out too late in the day. Aim for an early afternoon hike so you can enjoy the sun high in the sky – and still make it home in time for dinner. Remember to check trail conditions prior to heading out, and avoid icy trails. Winter gear and cold weather can affect you differently than it does during a spring or fall hike. Unless you’re an experienced winter hiker or headed out on a guided hiking adventure, it’s best to keep Zion winter hiking adventures short and sweet. 4. Stay on designated trails. This is always a good idea for two main reasons. It preserves natural habitats and it keeps you safer. 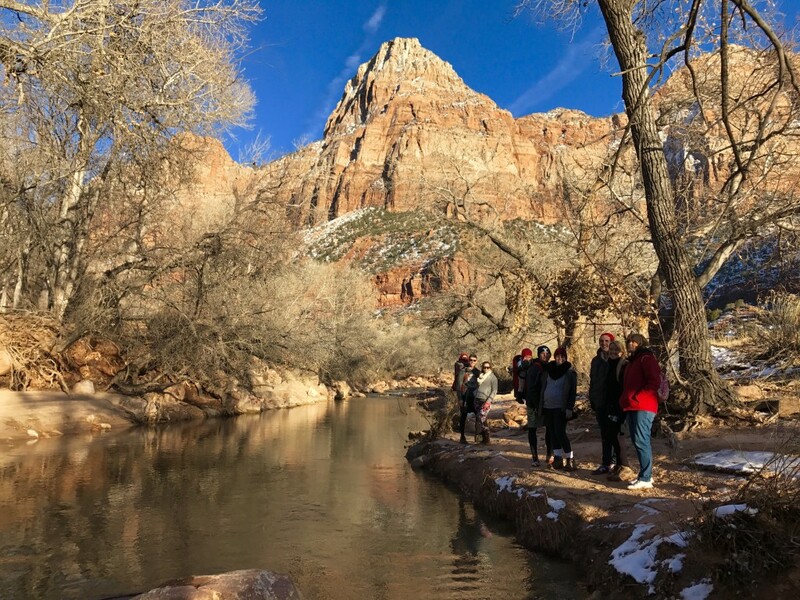 Most trails in Zion Canyon remain open during winter but certain trails—typically Weeping Rock, Emerald Pools and Angels Landing—may have areas that see little sun so be wary of icy patches. 5. Wear sunglasses and sunscreen. Utah’s winter sun can be deceiving and you may end up with the same rosy cheeks you can get on a summer hike. Bright white snow can also be blinding. Summer essentials like sunscreen and sunglasses will come in handy on Zion winter hikes. Just like in summer, you need to stay hydrated while winter hiking. You may not feel it but you’re actually sweating under your clothing. Carry water in an insulated bottle and avoid dehydrating drinks such as soda. 7. Tell someone where you’re going, and never hike alone. The same rules that follow the rest of the year are equally important when winter hiking. Let a friend or family member know where you’re going and when to expect you back. Guided hikes are a great way to ensure your safety and help you capture the hidden beauty of the park. Zion Ponderosa guides are CPR and First Aid certified. Book an East Zion Adventures guided hike.